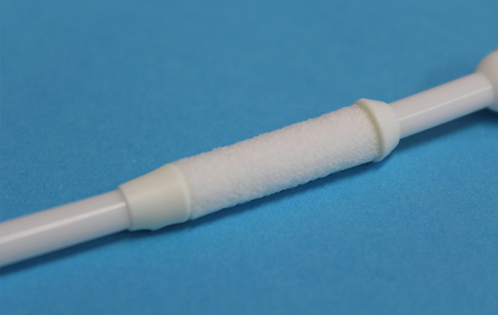 Marvao’s patented NexSite™ technology aims to promote dermal tissue ingrowth into a specially designed scaffold on the catheter creating a biological seal at the exit site. The NexSite™ ingrowth scaffold technology consists of two elements: a transcutaneous Dacron® cuff mounted on a catheter (Fig1), and a DISC (Dermal Ingrowth Support Collar) which is equipped with a Dacron® skirt that is designed to be placed under the skin at the exit site (Fig2). 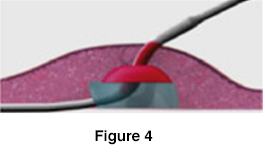 During placement of the device, the clinician positions the catheter cuff through the skin and the DISC such that the two Dacron® components are aligned to create a continuous three-dimensional tissue ingrowth scaffold positioned both below and through the skin exit site (Fig3). 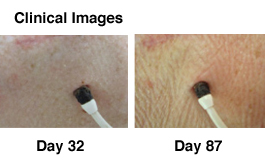 After placement, normal healing processes promote dermal tissue ingrowth into the Dacron®, forming a natural biological seal between the catheter and the external environment at the exit site (Fig4). 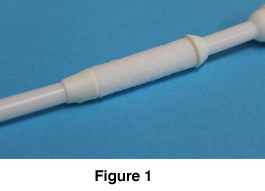 Data Summary – The Exit Site Management (ESM) catheter – A retrospective evaluation of the first in human use of the of the NexSite HD catheter – John Ross, M.D. Slide Presentation – The NexSite HD Catheter – John Ross, M.D.